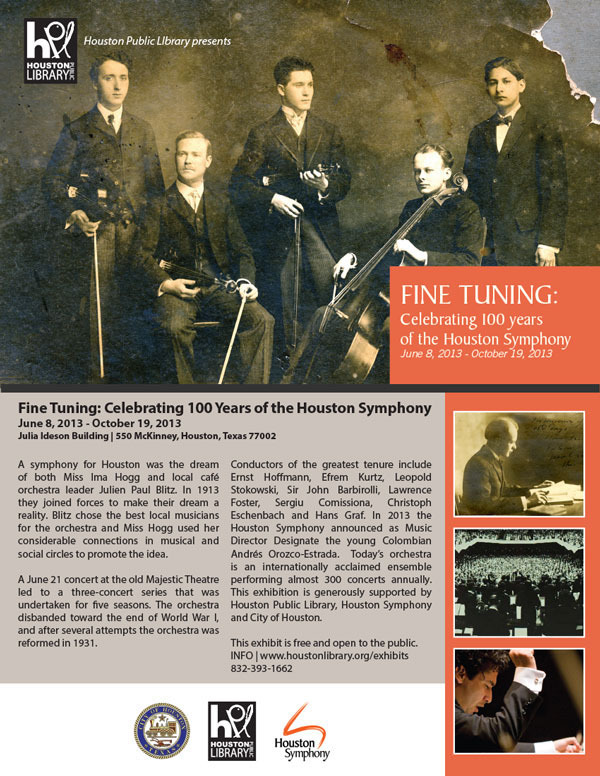 Now on display at the Julia Ideson Building of the Houston Public Library is an exhibit celebrating the one hundred year history of the Houston Symphony. In addition to photographs, documents and other materials from the Houston Symphony Archives, the Library will present materials and oral histories from its collections which relate to the Symphony. Extracts of interviews with Ima Hogg and others will be included. hours, 10 am – 8 pm Mondays through Thursdays, and 10 am – 5 pm on Fridays and Saturdays. The exhibit will close October 19. This entry was posted in Announcements on June 25, 2013 by Rebecca.